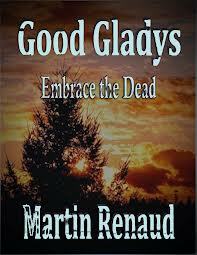 Good Gladys Embrace the Dead. It was an easy to read book, ideal for a read on holiday for instance. I liked the main character "Sauce", he had his problems but curiosity got to him and he took on the investigation with a lot of encouragement from Dara. The plot is unusual and there are quite a few twists and turns which are unexpected. The main characters were all good and fitted in well with "Sauce". I did not like the inclusion of the two young boys in the abduction though, it left a bad taste to the story, although that is just my own personal preference, each person will take something different from this part of the story. I think there could be further stories to be written involving "Sauce" and "BT" working together. I would recommend this book to anyone that likes a light murder/mystery, without all the blood and guts of some books that are out there. A murder mystery with a psychic twist. News reports that the famous psychic Good Gladys is missing coincide with the brutal stabbing of her business manager. Gladys's daughter Dara asks an old friend, private investigator Byrne Aase, to help find the murderer. She claims that the man the police have in custody is innocent. In fact, she believes that the accused is her mother, having been transformed into a man during a seance gone awry. “I never said you loved her. No, I agreed with Mummy that you are much more useful to us than a fawning admirer or a starched-shirt, lawyer-for-hire, yes man. You understand her.” Dara smiled.